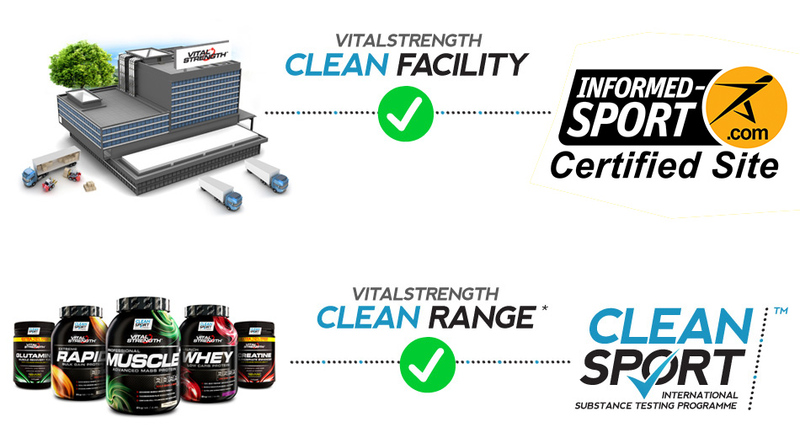 Powerfoods International Pty Ltd (Vitalstrength) was the first Australian sports nutrition manufacturer to achieve accreditation as an INFORMED SPORT CERTIFIED SITE, providing assurance to athletes of the high quality and integrity of the clean sport supplement products made and sold by Powerfoods International Pty Ltd. The Australian facility used to manufacture Vitalstrength products undergoes stringent testing to screen for substances related to the World Anti-Doping Agency Prohibited List to minimise the risk of banned contaminants finding their way into sport. Visit www.informed-sport.com for further information and specific details of the testing processes. Important Notice: Athletes subject to substance testing are advised to consult their relevant sporting body and carefully consider all the risks involved prior to taking any supplements. Information in relation to WADA, Informed-Sport, Clean Sport ™ and national sporting organisations is subject to change without notice. Athletes are strongly advised to make their own enquiries to ensure decisions are appropriate and based on the latest available information, policies and regulations.